Nestled between Stovers Preserve Beach and Potts Point Preserve is our coastal retreat in Harpswell, Maine. You will be greeted with fresh flowers, wine, cheese and a variety of Maine-made specialties. Breakfast is provided for the first morning with pancake mix, bagels, eggs, butter and wild blueberry jam. Crisp, cool sheets, comfortable beds, waffle robes and slippers will be awaiting you when you retire. Turkish towels and spa products will make your bathing a special treat. Air conditioning and heat are easily accessible to assure comfort every day of your stay. As you will see when you travel down the peninsula that reaches far into Casco Bay, there are ocean views everywhere you look. This newly renovated 2 bedroom (1 bedroom on 1st floor and 1 bedroom in spacious loft), 1 bath home gives you a true Maine experience. You will overlook the Cribstone Bridge, a National Historic Monument and the only of its kind in the world! Built with massive granite blocks which allow the tides to move freely through the bridge. The views of the islands and waters of Casco Bay make the trip down Harpswell Neck, with 220 miles of coastline, the memory of a lifetime. Harpswell has incredible hiking trails through pristine woods; many with sweeping ocean views. We will give a free 3 hour daytime boat tour or sunset cruise on our 24 foot Grady White with every reservation 3 days or longer (weather permitting- safety first). Seeing Harpswell from the water is a once-in-a-lifetime experience! The property is located above the garage and the owners live on the property in a different building. This is a true home away from home with a full-sized kitchen, an island for chatting while cooking, a lovely bath/shower with a rain shower head, an enormous porch and plenty of room inside in case it rains. There is a full-sized washer and dryer so you can travel back home or to your next destination with clean clothes! A short walk down our private road gives you an oceanside deck where you can read, relax or get some cool air and sun. Enjoy nature at its best, beautiful views and a private place to relax and call your own. As your hosts, we'll make sure that you have everything you need for your visit and we assure that the visit will be extraordinarily memorable! Additional Reviews: 5 STAR REVIEWS: We initially listed our property with VACASA in the Summer of 2018 and these are the reviews. The Drifting Inn was even cuter in reality than it looks in the pictures! It was also a cozy and easy place to stay for 10 days, with a full (and fully-equipped) kitchen, large private bedroom, and great loft with a second bed, desk, and cozy chairs. We loved the location, just a 7 minute walk from the beach, an easy walk, bike, or drive to a variety of lobster shacks, trailheads, and just 20 minutes from the friends we were visiting in Brunswick and Bath. Joe and Lynn were amazing hosts and gave us fun local tips that really enhanced our trip. We'd happily stay here again. Absolutely beautiful and Joe and Lynn were very responsive. There was everything you need and more. They had cheese and crackers, a bottle of wine, fruit, coffee, creamer, and two coasters for souvenirs. It was our first stop on our road trip of Maine and was our favorite place we stayed. Will definitely be going back to stay. Thank you again for your hospitality. "Your home is quite lovely, and you have thought about everything for your guests to be comfortable!" We have been life-long teachers who traveled the world working for the Department of Defense Education Activity. We've lived in so many countries to include Bermuda, Iceland, Cuba, Puerto Rico, Germany (Heidelberg, Stuttgart, Wiesbaden) and Abu Dhabi. We even lived on our 42 foot trawler for 7 years! We are now happily back in Maine as retirees to be closer to our families. We love meeting new people and invite you to see what Harpswell offers for yourself. We bought our home because we wanted to live by the ocean in a town that had a vital boating and fishing community spirit. Harpswell is that town. This is a fishing community that encompasses active lobster, scallop, clam, mussel and algae fishing and farming. The many nooks and crannies along the towns 220 mile coastline provide a variety of small communities with their own special flavor. We love the view, the people and the incredible sense of community in Harpswell. If you love the ocean and seafood treats, you cannot beat this area. The seafood is literally taken right from the water to the table. Our lodging is a newly renovated to retain the rustic charm of the original, but updated with new granite counters, bathroom and kitchen fixtures and all new lights. The expansive porch provides cool breezes and lovely views of Harpswell Sound. There are countless hiking and walking trails nearby as part of the Harpswell Heritage Land Trust that highlight the pristine beauty of Harpswell. Beds made with fresh linens for renters. These can be washed and dried by the renter if they wish during the rental period. 4 cars. More can be accommodated if necessary for short term. Available for off-season and/or winter rental. Quality spa products provided: Hydro Spa herbal body wash, shampoo, body cream and oatmeal soap. Couch, chairs, small dining table and 4 chairs. Provided Pantry: Spices, olive oil, coffee, tea, eggs, toast, half &half, sugars, wine, cheese, & tasty Maine made treats. We provide spices, dishes, utensils, pots, pans, cutting boards, knives, grilling tools, glasses and coffee and tea supplies. Small table with 4 chairs inside home. Also stools at kitchen island. Larger dining area on porch with benches and chairs. A variety of games and playing cards are provided. We provide boating opportunities with this rental at no cost to renters for reservations of 5 or more days (weather and schedules permitting). See Harpswell from an optimal viewpoint! Large deck (24' long) with ocean view, grill, umbrella, table and chairs. There is a golf course nearby on Brunswick Landing. Boat cruises to Admiral Peary's Island (a Designated National Historic Monument), Fishing Charters, Sailing aboard the Alert Schooner, and Lobster Boat Trips. Rentals of kayaks at H2O by Cribstone bridge, Casco Bay kayak tours information at cascobaykayak.com, or sail with Ark II Charters to Eagle Island by calling 207-833-5329. When I was thinking about what to do for my wife's birthday this year I was undecided. 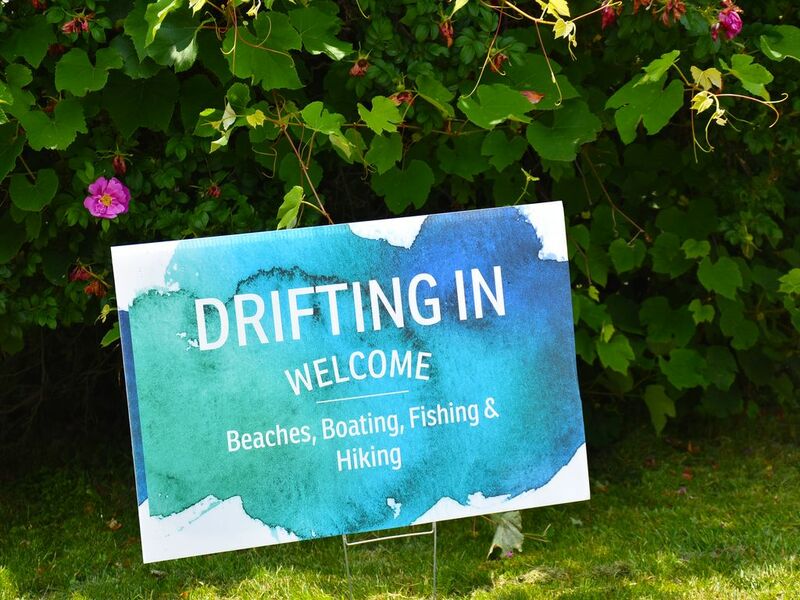 Our friends on Orr's island had been wanting us to come up in the summer for years, so we came upon Drifting. Simply stated, it was like a private bed and breakfast to us, food in the fridge, fresh linens for our stay , and great views of course !!! We truly loved our stay and will be back again !!! Thank you so much for the review, it is very much appreciated. You were great guests and we are so happy that you had a nice time for your wife's birthday. You are welcome back with open arms! The pictures and previous reviews did not prepare us for our incredible stay. Booking the property was the first indication of how wonderful our stay would be. Response to every question was quick and comprehensive. We always received more information then we asked, Lynn is a wealth of knowledge. Even though we arrived later than expected, we were greeted with a warm welcome and instructions to settle in for the evening. The provisions of wine and snacks were welcome after an 8 hr drive. A basket full of maps, events, food, things to do and more made planning so much easier. Jim gave us a boat tour around the islands and penninsulas of Harpswell. An abundance of local information and sights improved our experience. We loved exploring the area and Harpswell provided more than enough. The quiet and solitude was perfect, and having Lynn and Joe next door for additional information was perfect. Our daughter declared this her best vaction EVER. We must agree. PS, Lynn is such an amazing decorator. The little touches throughout made for a memorable experience. We can not thank you enough. Looking forward to coming back. Thank you so much for your visit and the wonderful review. We enjoyed having you here and are so happy that you chose our VRBO cottage. I do want to correct one item, that it is Joe who gives the boat tour of the islands. We do this for guests who want to see our area from the boat. We hope to see you again, you are most certainly welcomed back any time. Exceptional place to stay and nice owners--Joe and Lynn! We enjoyed our two night stay. We especially appreciated Joe's boat excursion and knowledge of the area. The boating was exceptional. If you love seafood, go to Dolphin's, Erica's, and Estes seafood restaurants in Harpswell. We went to all three. The accommodations were top notch. Again, thank you for the stay. Thank you for taking the time to post a review. We appreciate the feedback and you've been lovely guests. We had a wonderful visit to the Harpswell area and found "Driftin In" a very nice and comfortable place to stay. Lynn and Joe were very accommodating and provided valuable advice about the surrounding area. The ferry ride around Bailey Island was a highlight and walks along Stover's Point and Pott's Point were also relaxing. From the chilled wine to the fresh muffins, we had an excellent stay and will be back next year! Thank you for the lovely review. We appreciate it and look forward to seeing you next year. Lynn and Joe were the perfect hosts. Accommodations were just right and the sight seeing tour on the boat was absolutely amazing. Thank you so much for the lovely review. We enjoyed meeting you and hope to see you again someday. Hiking: Trails galore (Harpswell Heritage Land Trust) and town trails. Must see spectacular trail water vistas: Cliff Trail (park behind town office) Devils Back (on Route 24 Orr's Island) and Long Reach Preserve (on Route 24 toward Cooks Corner).